In many ways, the most underrated position in the history of basketball is the power forward. Usually strong in the post, with solid dominance all around, power forwards are essential to the team and in today's game, they can be seen as difference makers in general. 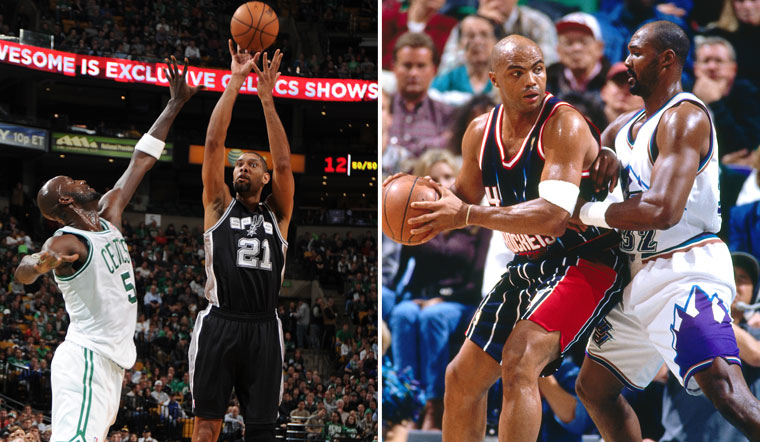 Today, we look at the position and the top 10 players of all time at the 4. -I struggled a bit with deciding the final choice for this top 10. What made me lean towards Bosh is his consistency over the years minus the injuries that have plagued him the last few years. He's played at a high level since entering the league, finishing on the All Rookie First Team in 2004. Selected 4th in the 2003 draft, Bosh went straight from Georgia Tech to the NBA and never looked back. After a few seasons of struggle with the Raptors, Bosh would end up leading the Raptors to the postseason and end up making the All NBA Second Team one season as well. 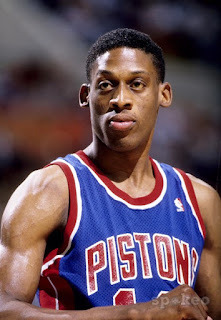 He would be named to the All Star game a total of 11 times and is the current leading scorer in the history of the Toronto Raptors. 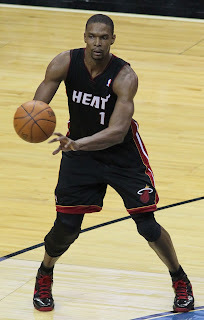 His time in Miami Heat saw him take a bit of a backseat to LeBron James and Dwyane Wade, but Bosh was still pivotal. This would lead the Heat to 4 straight Finals appearances and 2 championships. Bosh has played as a Center sometimes as well, but he's a core power forward and with his legacy and his accolades, he's certainly top 10 worthy. -Many crown Rodman as the greatest rebounder ever. I can see why. Whether or not I agree with that assertion, he is without debate one of the greatest rebounders ever and one of the best defensive players in his era. A 2 time NBA Defensive Player Of The Year, and a 7 time All NBA Defensive First Team member while also making the Defensive second team once. Rodman wasn't a huge scorer, but he was able to be effective on the boards and where it counted. With a career RPG of 13.1, it would be tough to argue with him as the greatest rebounder ever. A 7 time NBA rebounding champion, a 5 time NBA Champion, a 2 time all star, and a member of the Bad Boy Pistons, the rising Spurs in the mid 90s, and the 2nd coming of the Bulls dynasty, Rodman has been a part of basketball history multiple times in his career. He's certainly a top 10 power forward without question. -Well obviously, Bob is a bit before my time and I didn't witness his greatness like I did for a majority of this list, but who could deny his accomplishments and what he brought to the game. A NBA Champion, 2 time MVP, 11 time All Star, 4 time All Star MVP, 2 time Scoring Champion, Rookie of the Year, along with 10 appearances on the All NBA First Team, Bob is hands down a top 10 power forward of all time. There's no denying that. -Another one that I didn't necessarily watch. I'd say he and Bob could switch positions on the list, but I lean towards Elvin due to his dominance when necessary. 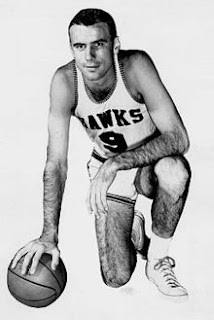 The Washington leading scorer was a NBA Champion, Scoring Champion, 12 time All Star, as well as a member of the All NBA First and Second Team a total of 6 times. 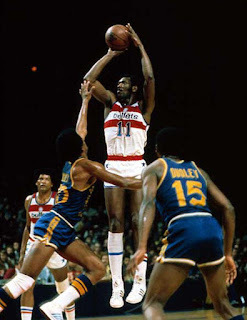 Also a 2 time rebounding champion, Elvin Hayes is certainly one of the greatest Power Forwards of all time. 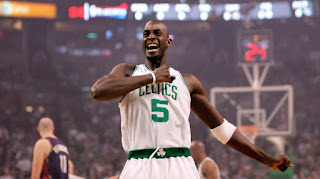 -The Celtics had a great player at the 4 in McHale. 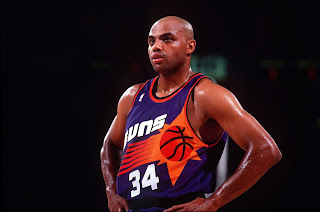 He was effective and very efficient, with great defensive play, making the All Defensive First Team and Second Team a total of 6 times (3 each), along with 2 Sixth Man Of The Year awards, 3 NBA Championships, a 7 time All Star and one NBA First Team appearance as well. 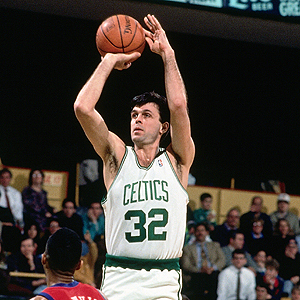 It is impossible to argue against McHale and while his contributions tend to go slept on compared to Bird in a way, there would be no successful Celtics dynasty without McHale at the 4. Hands down. -The recently retired KG is definitely top 5. The top 5 isn't even hard to choose in my opinion, it's just working out the order of 3 through 5 that can get tricky. I have KG as no. 5, and he is a multiple time All Star, with a crazy 15 appearances, a MVP award, two trips to the NBA Finals, one NBA Championship, 9 times being voted to the All Defensive First Team, 3 times to the Defensive Second Team, 4 time rebounding champion, and 9 overall appearances on either the All-NBA First, Second, or Third Team. The all time leading scorer for the Timberwolves definitely belongs on this list. Hands down. -A legend. Hall of Famer who never got a championship but had an absolutely amazing career topped off with a trip to the NBA Finals, a MVP Award, 11 straight All Star appearances including an All Star game MVP, was once named one of the 50 greatest players of all time, has 5 appearances for the All NBA First Team and 5 appearances for the NBA Second Team. 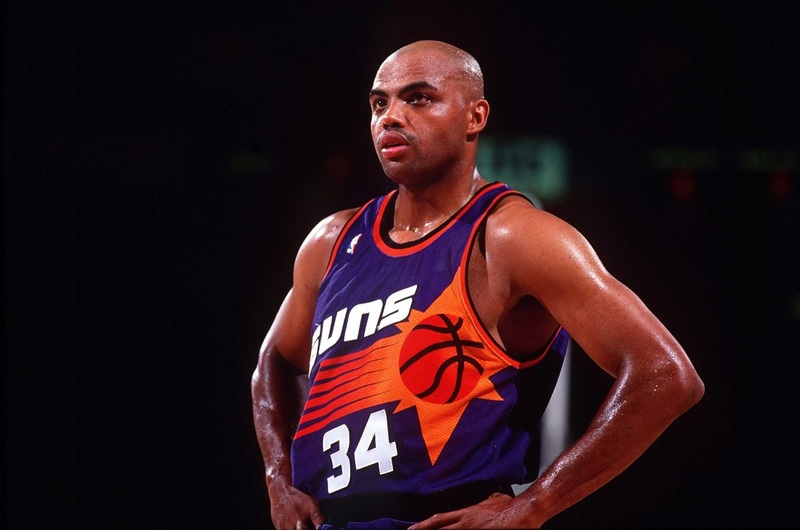 Barkley was a smaller power forward, but he still dominated and showcased toughness and strength in spite of this perceived weakness. Barkley definitely deserves this spot, though someone could possibly argue KG over him. I have Barkley at 4, just slightly above KG. 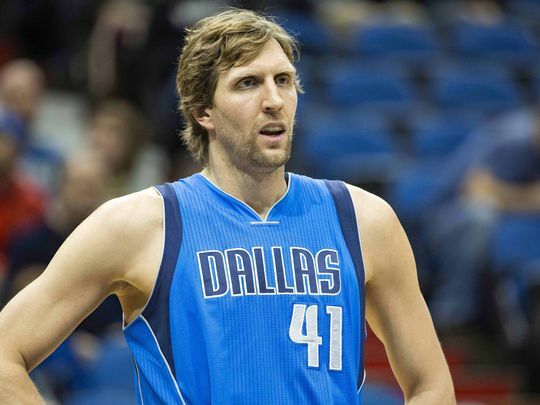 -When you speak of players from foreign countries, Dirk might be the greatest. This German power forward is easily top 3 on this list and with so many accolades to back him up, along with a signature shot, how could you argue this? A 13 time All Star, the Mavericks all time leading scorer, a MVP, a NBA Champion with a Finals MVP to boot, a member of the 50-40-90 club in 2007 and multiple appearances in the All NBA First, Second, and Third teams, Dirk is hands down a legend and as he nears the end of his career, his legacy is 100% solidified. -On any other list, Malone would easily be no. 1. One of the leading scorers of all time, Karl was amazing as a player and managed to secure something a lot of great players haven't: multiple regular season MVP awards. After securing two MVP awards in 1997 (I'd have given it to Jordan, but hey) and 1999, Malone also had 3 trips to the NBA Finals, and solidified himself as the leading scorer for the Utah Jazz. Along with 14 appearances in the All Star Game, 2 All Star Game MVP Awards, 11 All NBA First Team nominations, and 3 All Defensive First Team appearances, Malone excelled at just about everything he has done. Despite having no NBA championships, Malone is easily no. 2 on this list. I think we all know who no. 1 would be. Of course. -Was there any other choice? Really? There's no chance. The also recently retired Duncan is so ahead of damn near everyone on this list in general (minus maybe Malone, as they are sort of close), that it isn't really fair. The 19 year veteran amassed a legacy unlike any other and over his career, he made waves through the sport, and his accolades are endless. 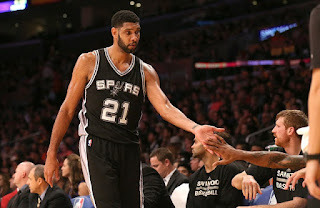 A 5 time NBA Champion with 6 Finals appearances (only loss came in 2013), a 3 Time Finals MVP, a 2 time regular season MVP, 15 time All Star and a All Star Game MVP, Rookie of the Year, the Spurs all time leading scorer, a defensive force with 15 collective appearances on either the All Defensive First or Second Team, and 10 appearances on the All NBA First Team with 3 appearances on the Second Team. There's no way that anyone could rank any power forward over Duncan. 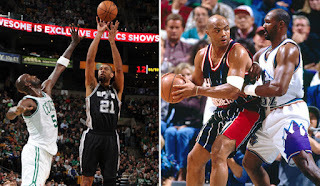 Duncan is one of the 10 greatest players of all time and he surpassed the Admiral and Iceman as the greatest Spurs player ever. There was no doubt about who was no. 1. Hands down, it's the Big Fundamental.